Greedy goblin: RvB, go fetch! Two weeks ago we made a mistake. The RvB allied status dropped on Friday and they could stay out of the war for the weekend. During that, they had a frigate lolling event to have fun and regenerate between wars. This time we won't let it happen! The structures of your master are in danger! Go fetch good doggies! On a different note. RvB - just like Proviblock - is a unique culture. You can do more or less the same thing in Nulli, SOLAR or RAZOR, if one falls, you can go to the other. But you can only live by NRDS rules in Provi and you can only engage in arranged, no-podding, cheap PvP in RvB. Compromising this and forcing its membership to a war that will destroy them is a pretty Goon thing to do. Since RvB attacked us and not the other way, my hands are clean. PS: Someone please explain this Goon pet that Crystal implants go to shield tanked ships, not stupidly blinged, "cap stable" Baltecs. I know it goes against your narrative, but RvB just announced they're going to war against BNI. Pretty sure that means they don't intend to defend goon POCOs since they'll be halfway across the galaxy. That's... decidedly not a baltec. "But you can only live by NRDS rules in Provi and you can only engage in arranged, no-podding, cheap PvP in RvB. Compromising this and forcing its membership to a war that will destroy them is a pretty Goon thing to do." ... and for the record, since nobody can compel anyone to log onto a specific alt on a specific account, no, nobody is forcing anyone to engage in a war. And for the record? That's not a Baltec-fit Megathron. That's not even close. A Megathron is not inherently a 'Baltec'. The only two types of Mega that are 'Baltec' Megas are either Megas that conform to the doctrine fit, or are flown by Baltec1. Clearly, that wasn't Baltec1, and the fit is actually pretty well documented from Fountain last year. 2 plates, tech 2 hardeners, MWD... and not even close to cap stable when that MWD spools up. So, yeah, one more time: words matter, and when you use terminology poorly, you only make yourself look stupid. Know what you're talking about before you say it, please. Oh, and here, since it took longer to pop up... the scythe loss that preceded the pod earlier. Again, notice how amazingly, none of the people on the kill are your boys. No Lemmings, no Marmites. 20 guys show up, and all your 'winners' run like hell. @Powers: cry about 3 T1 cruisers? You know that with insurance that's about 30M loss, right? Not exactly the same magnitude as the kills I've listed in the post. I for one am curious to see how this goes. You've succeeded in getting a few hundred members in your alliance, and that's not nothing... but is this meaningful? Your story is that RvB is the obstacle that stands in your way of victory (and that we are pets, morlocks and other sillyness). Now maybe RvB will let you give it a shot. I predict the CFC will make a few mistakes, granting you a few minor victories... but by the time the war with BNI is over, you won't have made any significant progress. But hey, maybe you'll surprise us all and take their few dozen POCOs. Then what? Lastly, regarding " most of them are friglolling casuals who can't keep up the constant war losses." What losses? You haven't demonstrated that these loses have been significant. People in RvB lose ships all the time, that's how it goes. I don't fully know the context behind Power's post, but if that is all the opposition you can raise against a goon fleet... doesn't look good. @LR: tomorrows statistics post will explain what will happen to RvB. The Goons ganked 3 cruisers camping Jita undock. That's clearly a feat beyond imagining. I'm "looking forward" to refuting your gloomy predictions for RvB tomorrow. Remember that Marmite has been at war with RvB a number of times, we've already demonstrated that we can operate under those conditions. In the meantime... camping the jita undock in *t1 cruisers*? Who's exhausted again? Actually, Gevlon, the goons killed 3 cruisers camping the Jita undock after making half a dozen more, and a vargur, dock up just by showing up - which is also where I lost that scythe, repping someone whom I didn't realize had a suspect flag. Tell me, if that's what 'winning' looks like against the kind of numbers we get for just dicking around (while fielding actual stratop fleets at the same time), what's it going to look like if we put a real fleet on the field? As for how it relates to this post? This post is about your narrative vis-a-vis RvB. That narrative has been that the CFC is letting RvB do all the fighting, and sitting in null laughing at them as they die for Goon POCOs. But there we were, and your 'winners' don't have the stomach to actually fight. Let them keep putting up gank numbers that look impressive to the people who don't know any better. That's fine, man, that's totally jake. But running and refusing to fight your 'real' targets isn't how you win a 'war'. - Goons formed a fleet at a random time. - Scared off/killed a few random campers. If I gather 50 men at some random tim, go to VFK, kill some noobs on the undock who ignore 50 reds on local and no Goon FC bothers to form a fleet, can I claim that I defeated GSF? You know I checked the killboard on the morning and did not even NOTICE that there was some fight. @LR: wait for the grim numbers. Hint: the most grim aren't even related to Lemmings or Marmites. @Gevlon, you're wilfully missing the point, which is that in order to take the POCOs, you need to fight over them. To date, no 'Lemming' has ever been on grid with a POCO coming out of RF. This makes it exceptionally difficult to, you know, take them. You don't seem to realise that you are paying Jita campers, in the vague hope they one day decide to bash structures. This would be like me hiring a car engineer, and just hoping he starts work on a plane design, when I haven't made it a requirement he does. Your people have 0 motivation to ever fight us for a POCO, because they know the very best case is they lose half a fleet or more. And, critically, you pay their wardec whether they do or not! Why would they do it? You don't understand people so you fail to realise your whole plan is a complete fail, as you simply aren't doing anything to reach your objectives. These people are all about jerking off to their 95% dock-camping efficiency, and will never do anything that means a fight might take place where they take losses. I'm afraid you need a way to make people try to take the POCOs, or it will never happen. @Anonymous: I'm working on the POCO issue, but it's not crucial. POCOs are a mean to hit Goons and not the goal itself. Didn't you comment a few weeks back that the victory condition for your whole campaign is removal of all Goon pocos? Now it's not even crucial? What exactly is the goal now? That Goons collapse and disband? POCOs are a milestone on this road, no doubt, but the war won't end with them, nor there is any reason to focus on them. Gevlon, are you familiar with the concept of "Fleet in being" ( http://en.wikipedia.org/wiki/Fleet_in_being )? In EVE, like in naval warfare, various groups can exert influence and project power just by *existing*. For example, for a long period N3/PL's supercap superiority forced others to change their tactics (bomberless siege bombers) just to avoid it. Both RvB and the CFC have demonstrated that they will form up on a timer with a substantial fleet. That's what is required to destroy, or defend, structures such as POCOS. The marmite and lemmings are demonstrating that they won't form up. This only reinforce the current power structure. 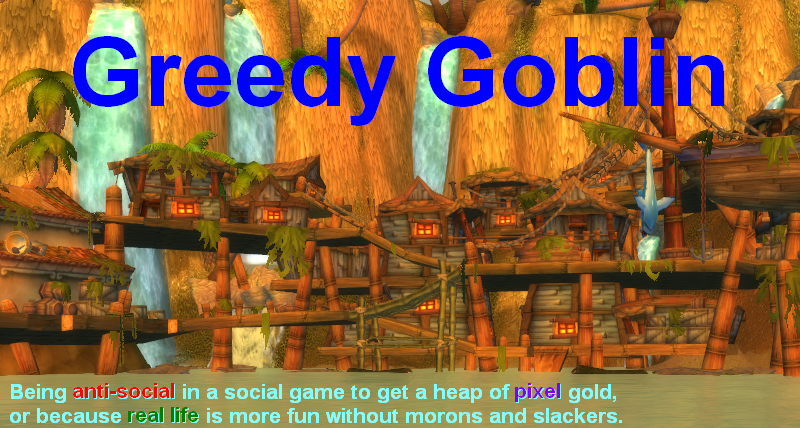 Actually Gob's there is another NRDS place, there is a group operating out of GW who practice NRDS. Granted it is not universally followed but yeah. and anyone can play by NRDS rules any time. In fact I would suspect that Provi has a longer list of reds than any other group. This is getting to be just silly now. "Oh you never fight us, oh you always dock up when we arrive"
No kidding, guys. Gevlon has said time and time again that he's got no intention of providing 'gudfites' (that's the lingo, right?) that Goons and RvB want. They have far, far, far superior numbers and their whole culture is about either swamping people with numbers or pre-organized frigate nonsense - I don't play EVE, but that's what I see. Like, he's LITERALLY saying "I will beat Gonns and RvB by not giving them anything enjoyable to do. It is fun for us to blow them up and make them go sit on timers that we have no intention of contesting". He's fulfilling his conditions, his Lemmings program is growing, yet there are still people here who - having FULFILLED his conditions, fleeting up and roaming around and being at uncontested timers - crow about some kind of victory. Wise up dudes. In a month's time when he's still inflicting substantial losses on the people who *want* to play home guard, still forcing people to show up at uncontested timers, just who among the Goons and RvB is still having 'fun'? Just who is still going to turn up for the NEXT time he pushes a POCO, because THIS time might be the flip? Even dogs get tired of fetching sticks for no treats. Gevlon has you dancing to his tune and your constant 'but we're winning and you're losing' looks more and more like flimsy self-justification. "Like, he's LITERALLY saying "I will beat Gonns and RvB by not giving them anything enjoyable to do. It is fun for us to blow them up and make them go sit on timers that we have no intention of contesting". He's fulfilling his conditions"
and so on. The point it, from a narrative perspective it is very easy to make it seem like you are winning when all you ever report are your victories. What myself and many others find amusing about this whole thing is Gevlon's (and apparently posters like yourself) utter failure to understand that his largest victory condition (In which we accept peace terms) will never ever happen. Gevlon could get the entirety of eve on his side and take the last CFC system, and yet goons still would never agree to such terms. Not due to pride, defiance, lack of diplomatic channels (though those certainly factor in), but because such terms dictate that the game be played a certain way (which no one who actually treats this as a game will ever do), but because some of the terms fundamentally don't understand the organization (goonwaffe is the bottom rung by which all other member corps are compared), the terms will never be fufilled (I can't see any goon stopping the use of the word pubbie, a word used in games war outside the scope of eve), and because such terms dictate that the game be played a certain way (which no one who actually treats this as a game will ever do, least of all goons). 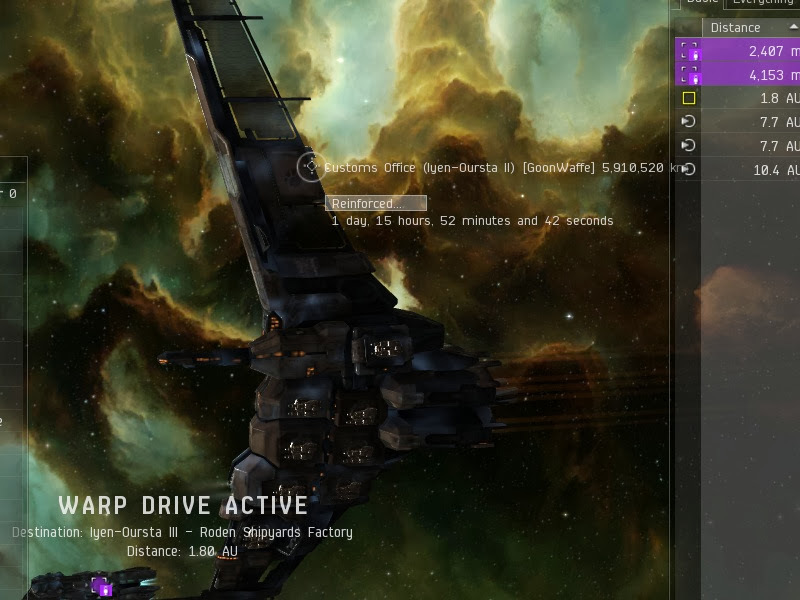 Eve Online is a sandbox game. There is no one "right" way to play it, and Gevlon seems to not understand that. The only reason goons ever pay attention to this blog is a simultaneous feeling of astonishment and amusement derived from reading the ideas of someone who thinks there is only one right way to play a video game. I offer these insights not because I think Gevlon will at all take them into account (He won't, and if anything this post will not see the light of day), but in the hope that some reader following this blog understands that all these blog posts about goons are simply a narrative to something that will never ever succeed. I have read this article several times always laughing a certian point. But somehow when I get to posting comments I keep forgetting it. "Go Fetch, little doggie your masters stuff is in danger"
I still don't a solution (to beating the goons) without also finding a way to rehabilitate them. Many many corps and alliances have a "no former" goon policy. Till Goon member can move on to other pastures they will have to stay in goony land.